I am a believer in a very private way, but in India you don’t have to be rooted in a particular faith to be aware of the omnipresence of God or gods. They’re everywhere, millions of them. You see them being worshipped in temples, on streets, inside houses, at lavish mass events and at remote pilgrimages. They exist in discriminatory practices of their dear devotees and in protests against their depiction or interpretation in the arts. They are also a source of riches – and exploitation – for many. But faith can be an ennobling experience as well, especially if you visit the largest religious congregation on earth, as I did in 2013 in the northern Indian town of Allahabad. 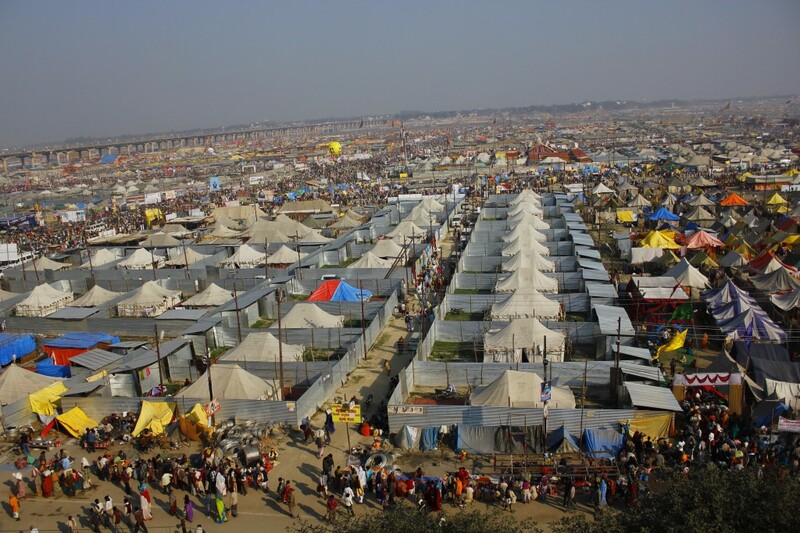 It’s where the Ganga, Yamuna and the mythical Saraswati rivers meet. 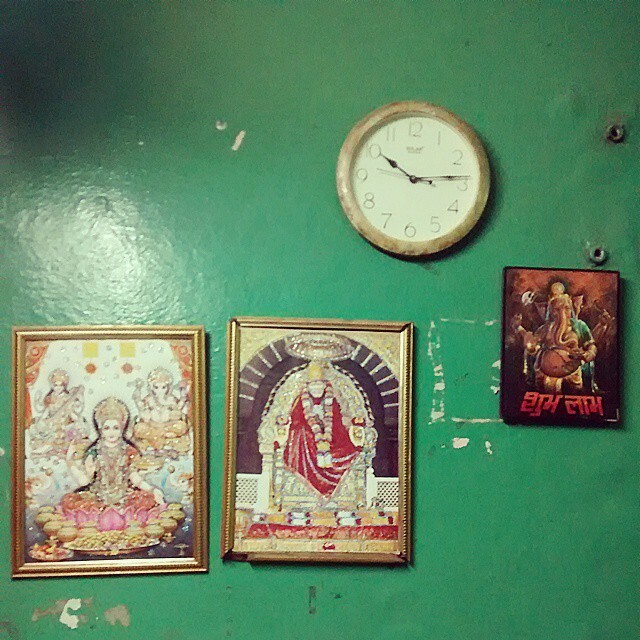 I shot this picture at a dhaba in Delhi. A dhaba is a makeshift restaurant that is mostly found on highways, an affordable eatery for many a traveler, particularly truck drivers. Dhabas also exist in every nook and corner of the country. Their popularity knows no bounds for their spicy mix of Indian curries, and breads. A humble sight, this, with pictures of gods and a clock hung against a green wall appearing to me a portrait of sincere piety, expected to bring prosperity in the restaurant owner’s business. The goddess sitting on the lotus is Lakshmi, the bringer of wealth. In the centre is Sai Baba, a spiritual guru believed to be the incarnation of God. Next to him is Lord Ganesha, Lakshmi’s adopted son. He is the first god to be worshipped at the start of any auspicious event. It was past 10 p.m. I picked up my order and left, but the image of the green wall shall stay with me forever. Amen!